Managing direct mail data - sending mail to people who have moved, vacancies, and invalid addresses not only means you wasted postage, it also means that you have to waste time getting the new addresses in your database, and updating invalid addresses so you don't mail them again. You might even incur fines from United States Postal Service if you send enough mail. Maintaining deceased suppressions - mailing to deceased donors is harmful to your brand, constituent relationships, and it also contributes to wasted spending because your engagement efforts won't ever make it to the intended recipient. Acquiring enhancement data for segmentation - sending the right message to the wrong person is a wasted opportunity. Without data enhancements and segmentation, you miss opportunities to meet donors where they are. 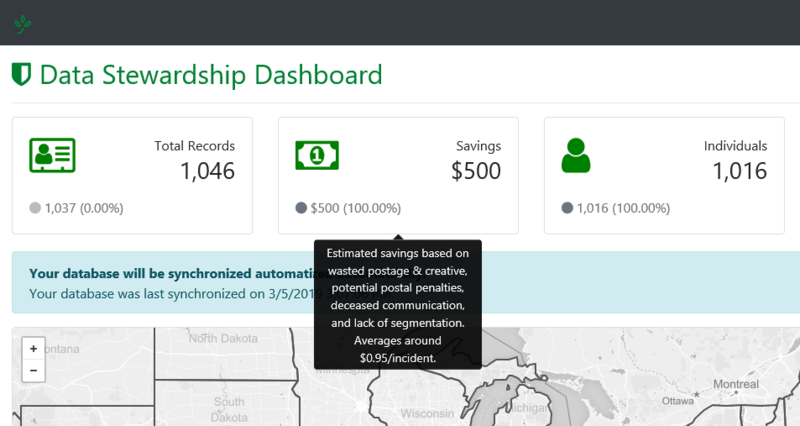 TrueGivers estimates savings based on wasted postage & creative, potential postal penalties, deceased communication, and lack of segmentation. The savings figure in bold in the upper right indicates the total estimated savings for your account. The grey figure below this indicates the savings since the previous update, and the percentage of change in savings since the previous update. We base our saving estimates on data from all of our products including TrueAppend , TrueDeceased and TrueNCOA. Individual results can vary widely based on an organization's data quality and best practices. Register now for TrueGiver's Data Stewardship Services for fully automated hands-off data updates.